Microwave Bread Pizza has become my favorite quick meal recipe. You can have it for breakfast, lunch or dinner. Just the number of bread varies. A very simple recipe. I wanted to try this for a long time now. I saw this recipe at priya's and was very tempted to try it out. As I did not have microwave that time, I couldn't. This is one of the quickest recipes you can try out and your kids will go glutton for sure. If you ask me if it is healthy, I would say, yes to a certain amount. If you use whole wheat bread and stuff the pizza with veggies especially broccoli and use less cheese it is a healthy version. But, once in a while you can treat your tongue too! 1 tbspn pizza sauce, if you do not have this you can go with chilli sauce too! Take a bread slice and add the pizza sauce. Top it with the other ingredients and finally with cheese. In a microwave safe plate, place the bread slice and cook it for 3 min in high. Allow it to cool for 2 min and then serve. First time here,from anudivya's blog...Cool blogs you have...especially ur thamizh writing blog..kirukkalgall. looks so yummy sangeeth.. wanna have it. oooh! Niceeee! Mozzarella cheese is my favorite... and I will be trying this for sure. Seems quick and easy. Inaikku ur bread pizza pic is bigger right? nalla irukku. Forgive me if I've said this before but I am constantly amazed at the things that can be made in a microwave. 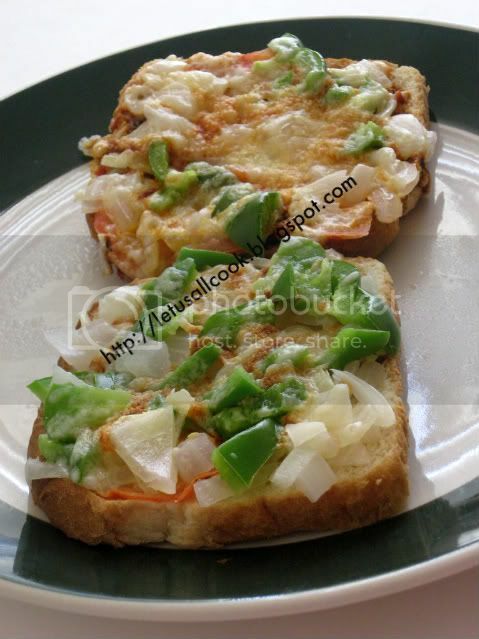 Gorgeous Bread pizzas Sangeeth..thanks for trying this, am very glad.. Right now I am eating pizza and reading your post on bread pizza. Yummy! Easy and delicious. I usually make this with leftover chapathis. Have you tried this on the salted rice cakes, that's good too. Sounds easy and a great way to use leftover bread. Always wanted to make pizza at home for kids , but never made ,as didn't had oven,but nice to see ,it can be done in microwave too. "ll definately make it soon. Hello ! Greetings from Bangladesh. I just discovered your amazing cooking blog just today! U know I always face problem with making a perfect pizza dough! My dough is never perfectly done! But now i can make a pizza without thinking about a dough! Thanks a lot dear. Thanks for sharing this recipe it's definitely a really good reward for my brother who got his Food Safety Training last week. But still work on the dough first. I'm not really the cook-type but I'd like to do something special for him.